Through years of experience dealing seriously with Lotus parts needs for our customers and taking care of maintenance and repair needs, we are always able to deliver great value for money that caters for owners of all modern Lotus cars. At Hangar 111 we have witnessed and noted the short and long-term performance of hundreds of aftermarket and original Lotus Parts. This has left us with a clear picture of the parts that reallt work and those that do not. Because we cater for such a wide range of customer requirements we have selected and developed products that are fit for your precise purpose whether it is for the road, track or racing. So, if you take your Lotus seriously like we do and want parts, accessories and services that will perform to our high standards drop us a line or take a look at our Online Store. 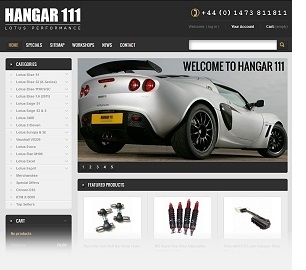 With an online web-store, fully equipped workshops and years of experience we can cater for those thinking seriously about their Lotus maintenance requirements.